Editor(s): Tremblay, P.-E.; Gaensicke, B.; Marsh, T.
This meeting was part of a series of biennial workshops started 42 years ago in 1974 in Kiel, Germany. 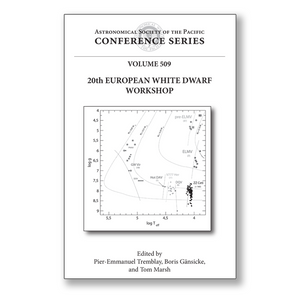 The 20th EuroWD was the primary conference in 2015 and 2016 for researchers working on white dwarfs, and these proceedings present a snapshot of all aspects of current research on these exceptional evolved stars and their environments. The 20th European Workshop on White Dwarfs had a record number of 148 participants from more than 20 countries. The oral and poster contributions were diverse, covering white dwarfs found in different Galactic environments and observed with many distinct observational techniques. Topics discussed in these proceedings include 1) white dwarf structure and evolution, 2) atmospheres, chemical composition, and magnetic fields, 3) pulsating white dwarfs, 4) progenitors and central stars of planetary nebulae, 5) binaries: white dwarfs with stellar or sub-stellar companions, double degenerates, and white dwarfs in cataclysmic variables, 6) degenerate stars as SNe Ia progenitors, 7) white dwarfs with evolved planetary systems, 8) white dwarfs in stellar clusters and in the Galactic halo, and 9) white dwarfs as probes of mass loss, the local star formation history, and the initial mass function.